We currently offer 4 different types of Branding Methods across our USB Flash Drive range. Depending on which model you choose, you can either have your logo Screen Printed, Laser Engraved, Embossed or Photo Printed. 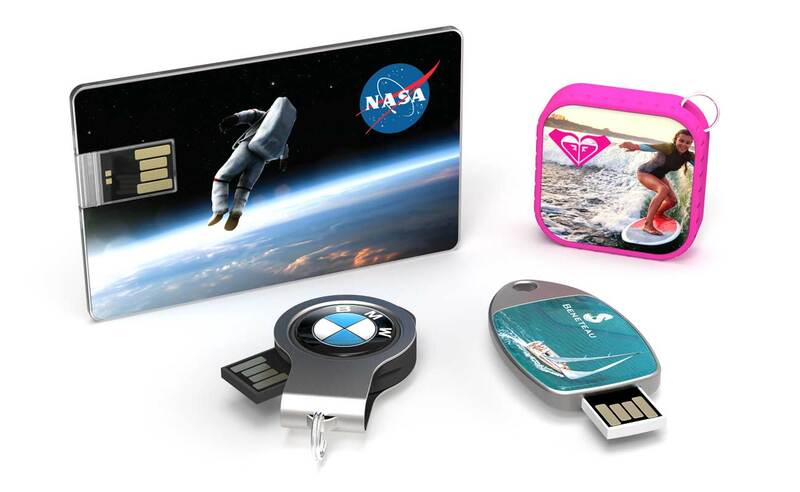 Our latest post is all about Photo Printing and how it can earn your Branded Flash Drives the attention they deserve. At the time of writing, we have 4 models that can accommodate the Photo Printing Branding Method. The Wafer, Light, Trix and Fin. Each model starts with a blank canvas and we apply your chosen image via our Photo Printing method, more on that later. The Photo Printing Branding Method allows you to combine your logo with an extremely detailed image. The image can be one of your own or it can be a stock photograph from a supplier such as iStock. As you can see from our examples below, this Branding Method allows you to get quite creative. We’re here to help you along the way too, of course. Similar to desktop printing, our Photo Printing technique combines 4 colours known as CMYK in varying amounts. The result is a very detailed Photograph that sits on the Flash Drive canvas. Our Light and Fin models are covered with a polyurethane resin dome and our Wafer and Trix models are covered with a transparent sticker. This protects the artwork from minor scratches and bumps.